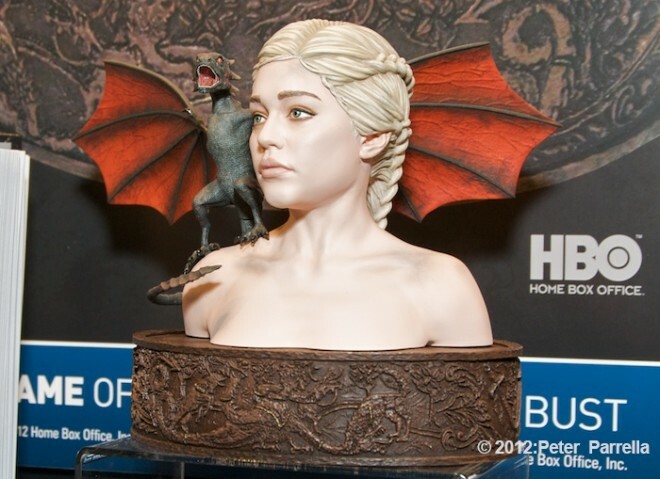 Gorgeous Game of Thrones Busts of Tyrion Lannister, Jon Snow, and Daenerys Targaryen from Dark Horse – due out in 2018. 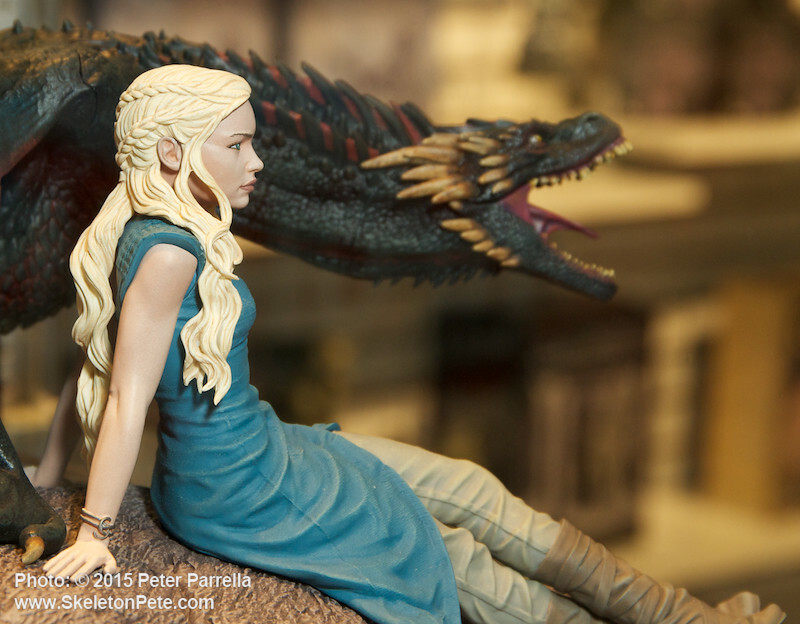 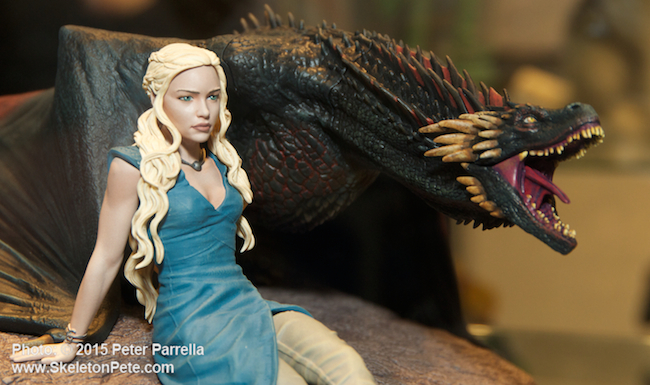 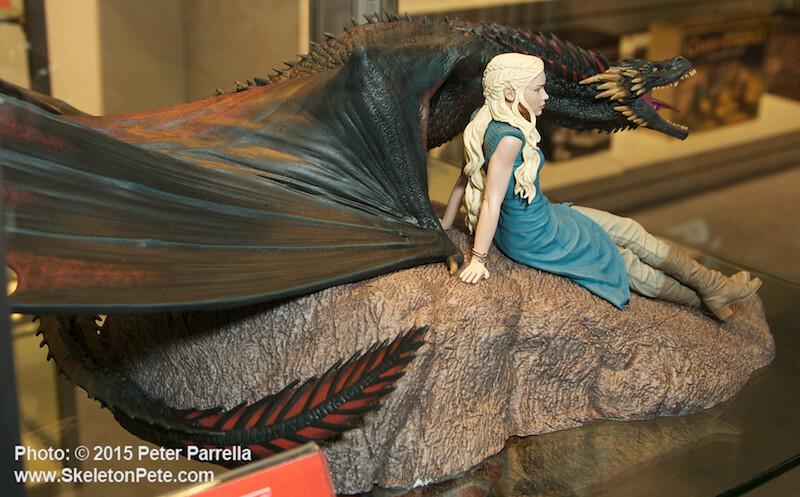 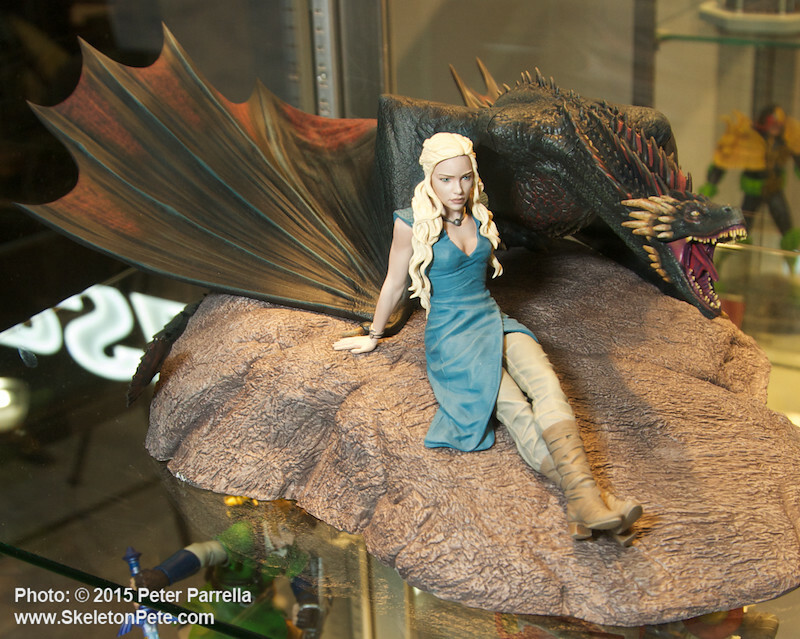 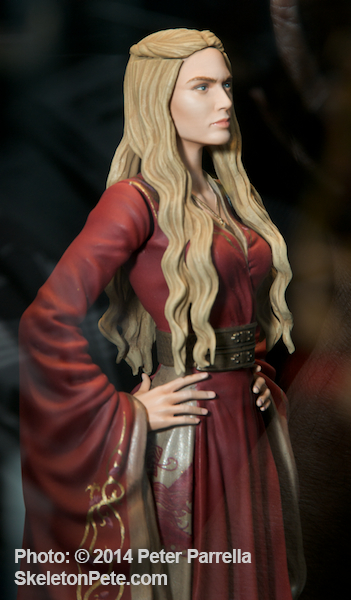 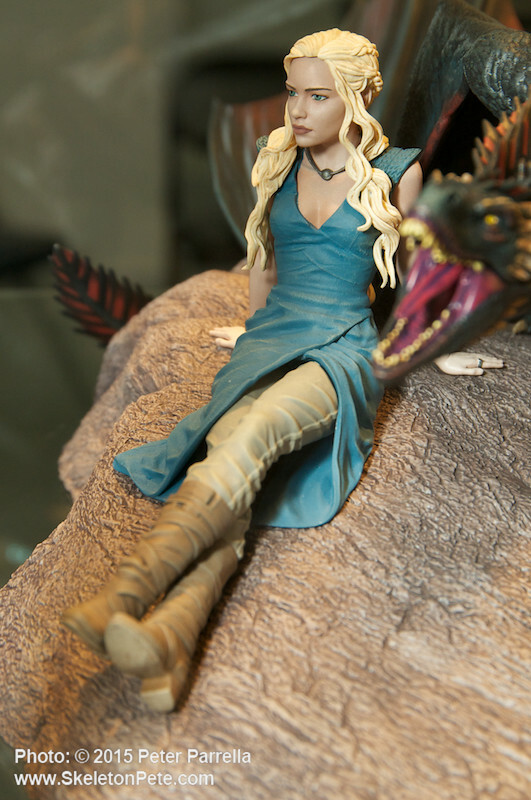 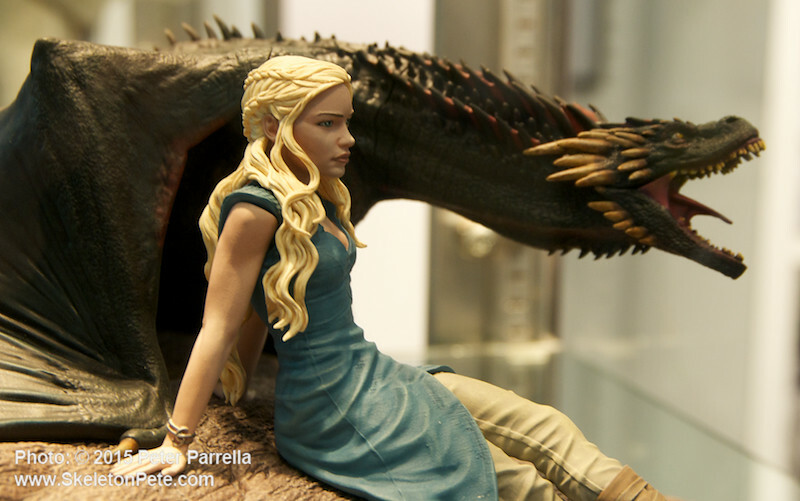 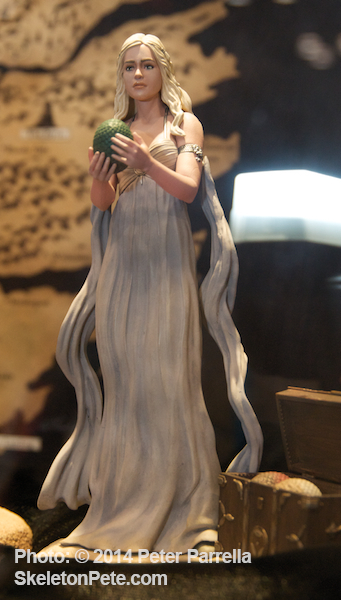 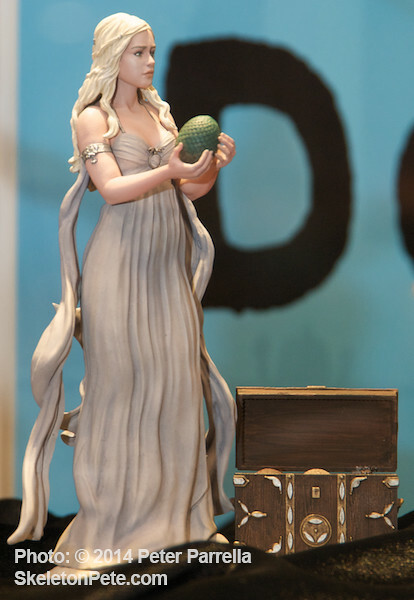 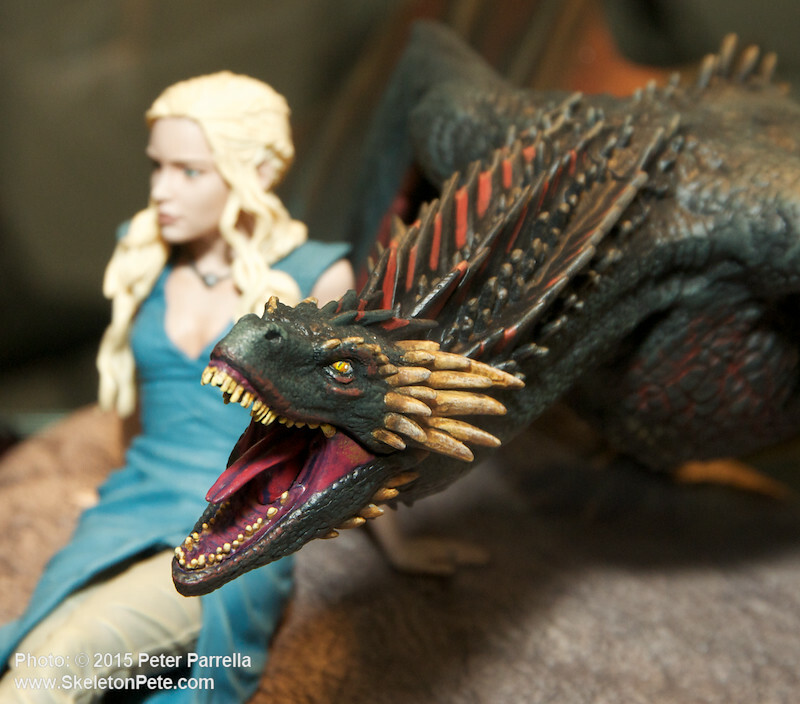 Dark Horse Daenerys Figure Was Released in January 2014. 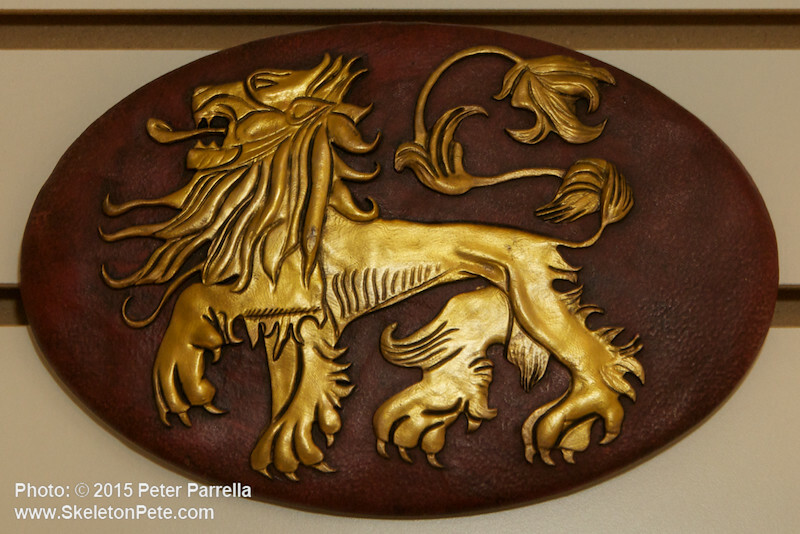 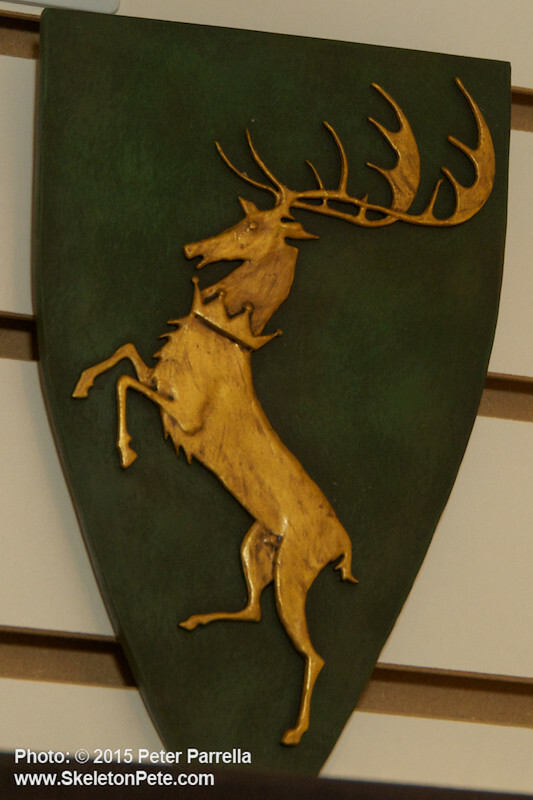 Today, fans worldwide are dusting off their family crests. 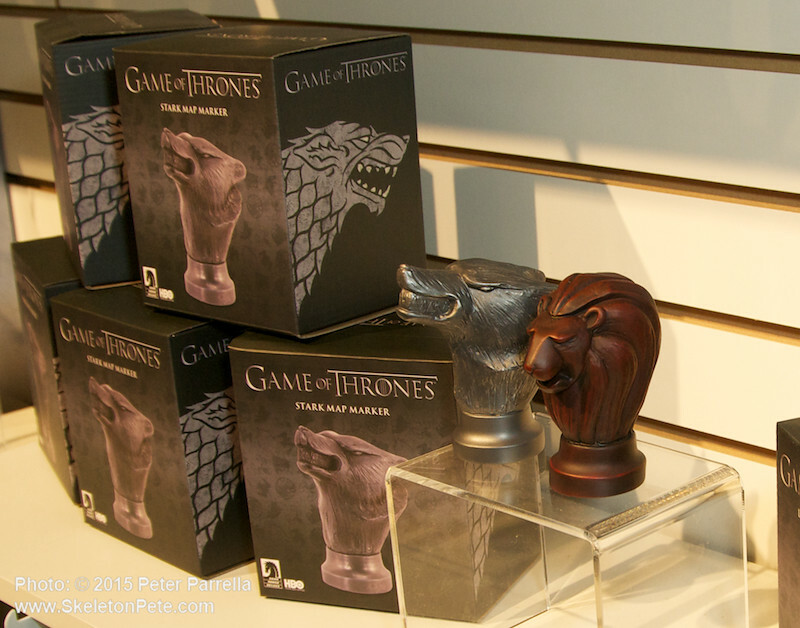 Well, not their family crests, but whether you belong to house Targaryen, Lannister or Stark, you’re bound to be excited about the Season 4 premiere of Game of Thrones, debuting tonight on HBO in the US and tomorrow night in the UK. 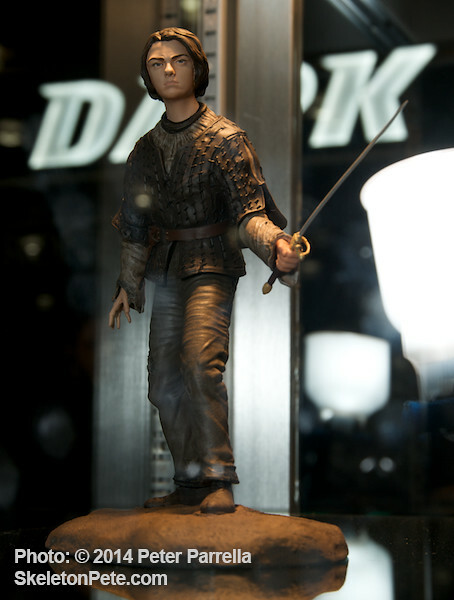 Based on the books by American author George R.R. 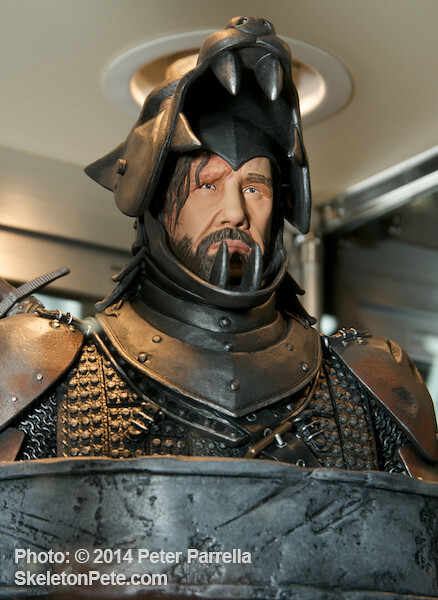 Martin, (dubbed by some as the modern-day Tolkein) the fantasy series set in the middle-earth-like isle of Westeros has everything you can ask for – drama, political intrigue, epic battles, swords, sorcery, and zombie-like white walkers. 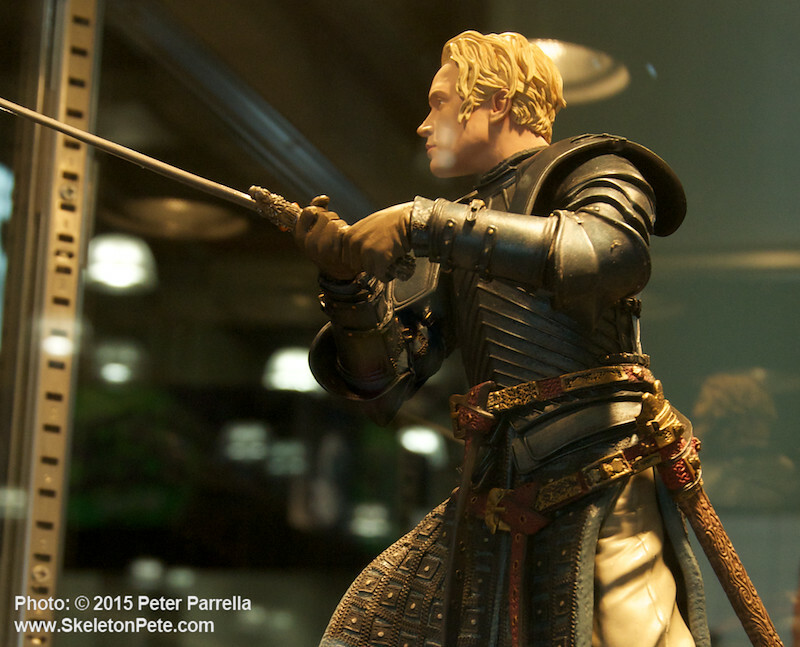 Martin’s characters are complex, with many layers, motivations and conflicting emotions. 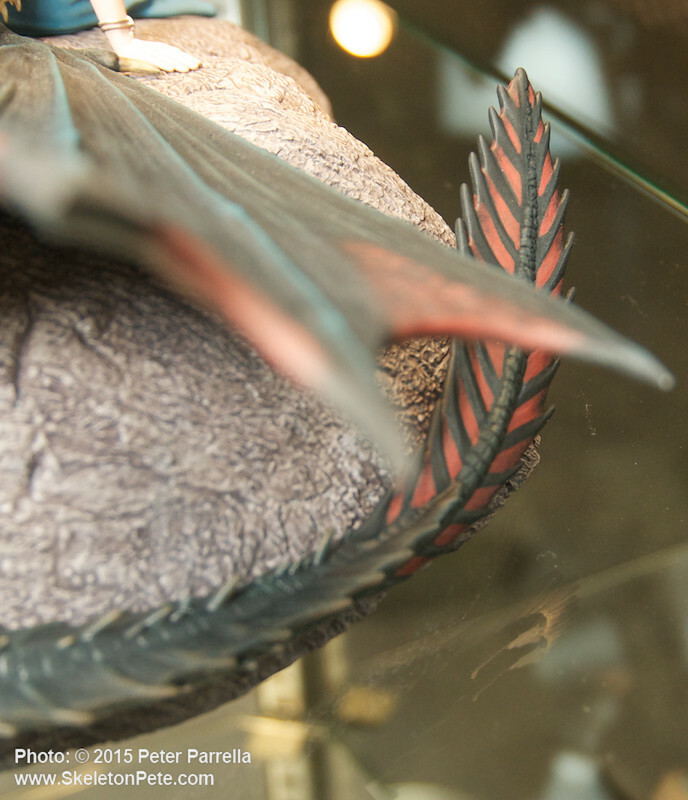 You love them. 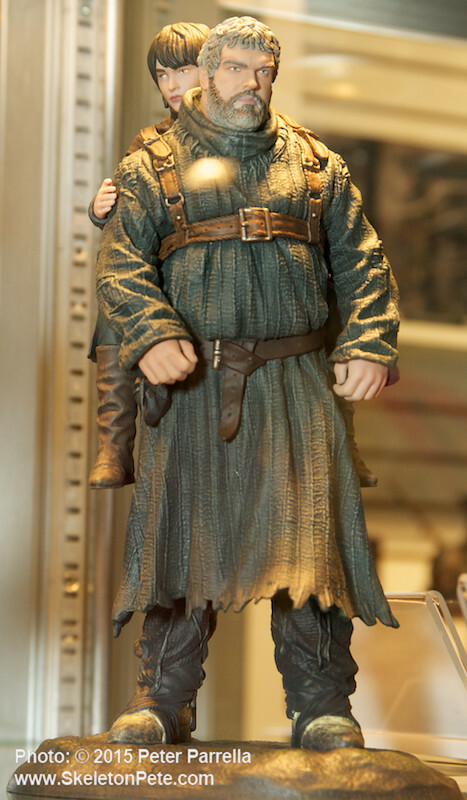 You hate them. 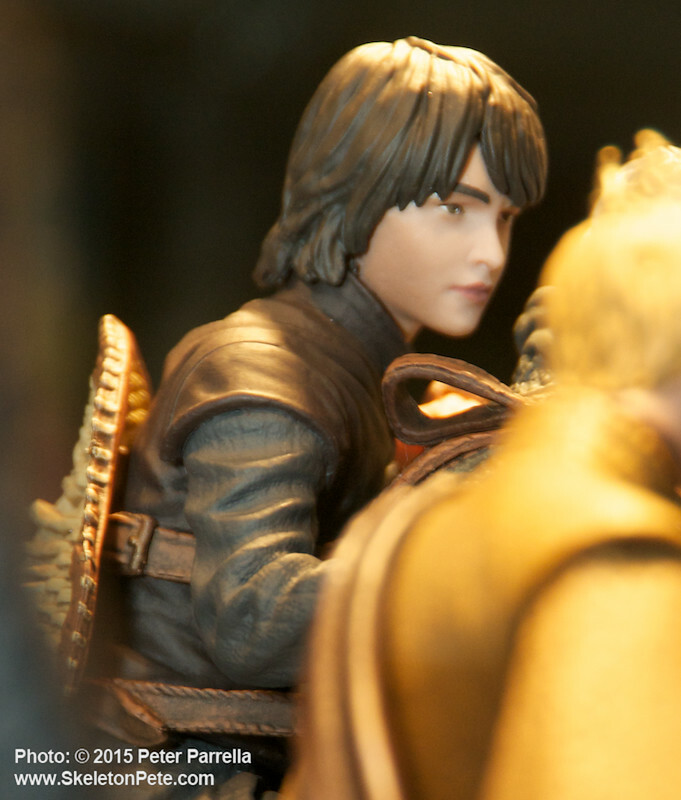 Are they good? 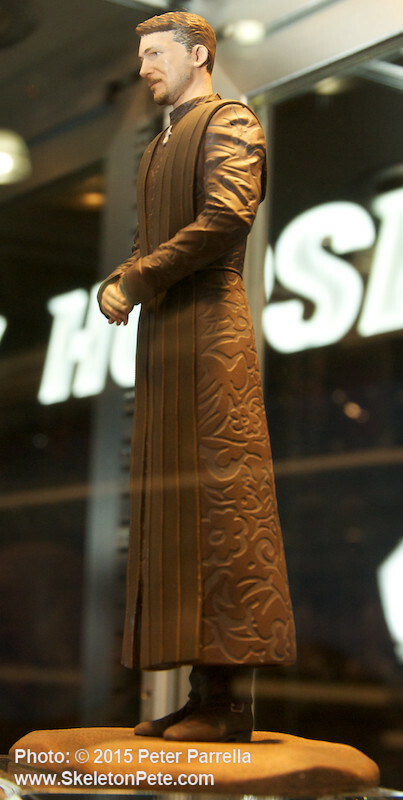 Evil? 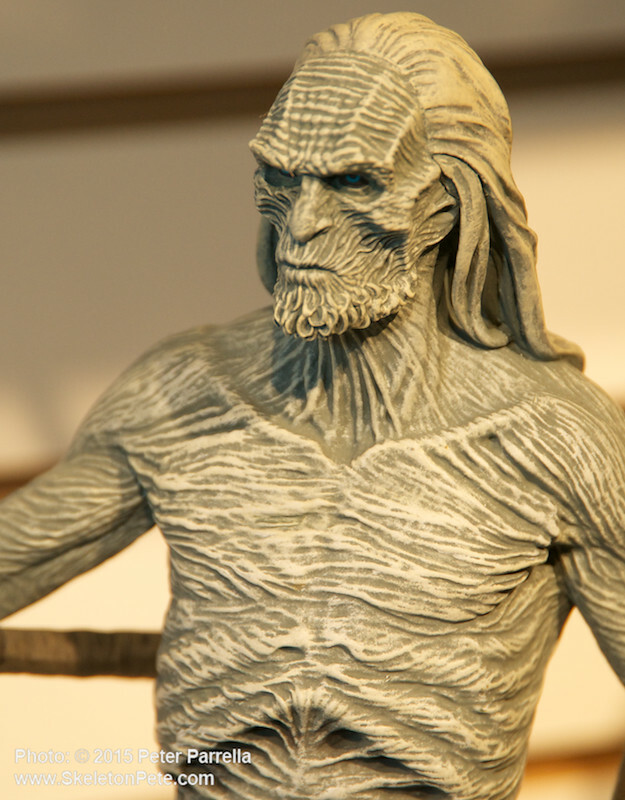 He takes his time crafting their inner-worlds (giving us each character’s point of view in the books) with as much detail as their outer worlds. 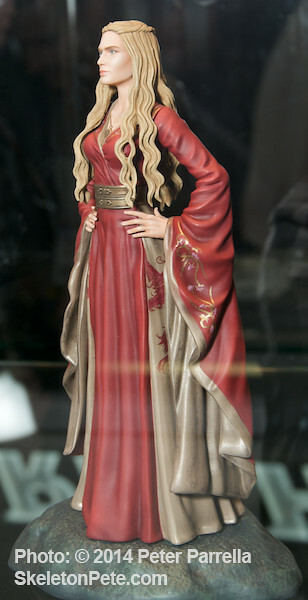 With characters like the initially-innocent child-bride-turned-Mother-of-All-Dragons, Daenerys Targaryen (played by Emilia Clarke) and the brilliant, often insightful, imp, Tyrion Lannister (Peter Dinklage), the tomboyish and tough Arya Stark (Maisie Williams), and the morally ambiguous Cersei Lannister (Lena Headey – Sarah Connor Chronicles), we’ve become invested in each one’s journey – whether we like them or not. 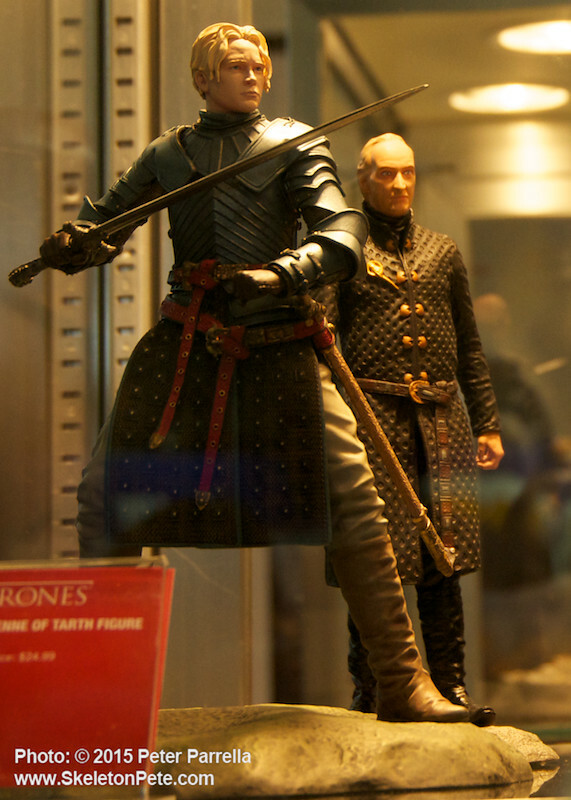 In Westeros, only the hardest and most ruthless seem to survive. 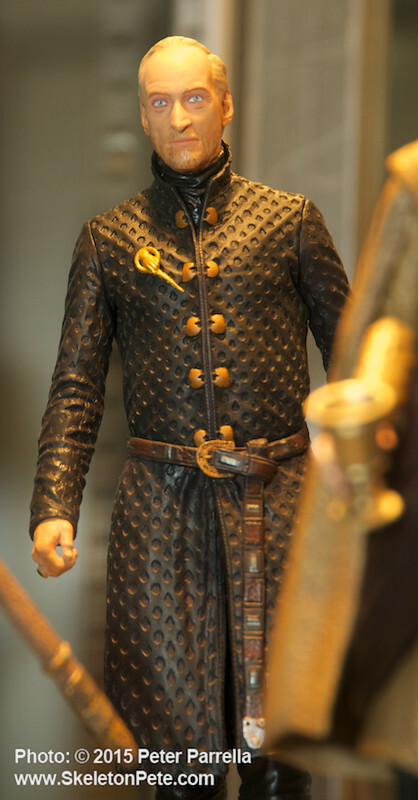 That’s what it takes to rule a kingdom. 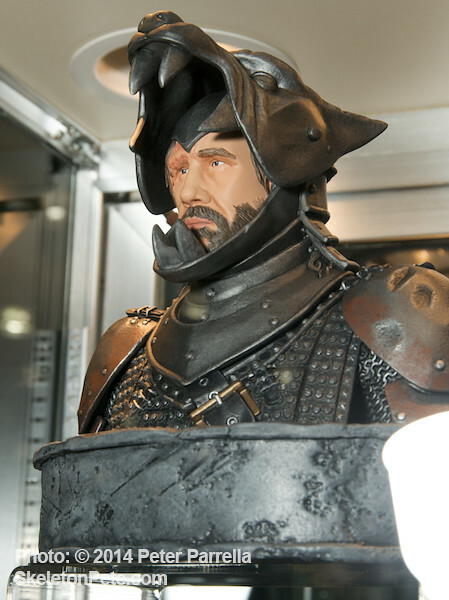 Even then… any weakness can be exploited. 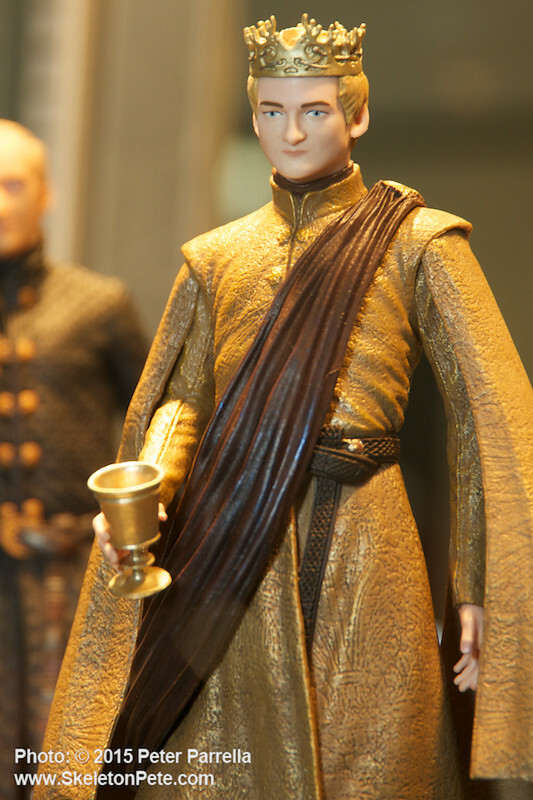 Fortunes and destinies can turn on a dime. 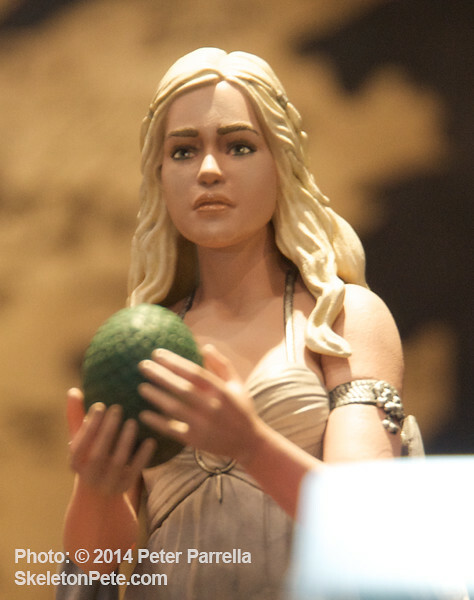 The outcome is never certain. 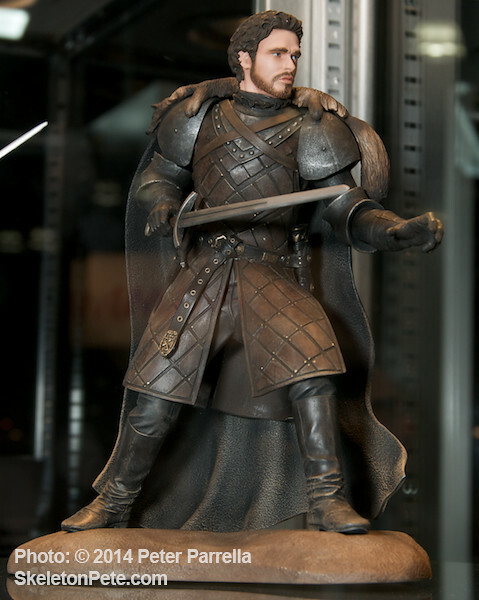 Robb Stark Figure will Arrive in Early August 2014. 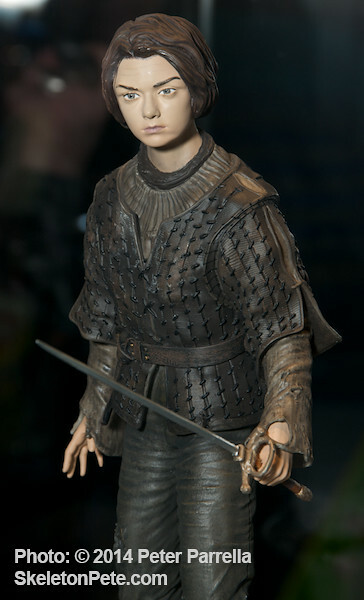 Personally, with Starks (my chosen house) dropping like flies (if you haven’t heard about “The Red Wedding” by now, I have little pity if I spoil it for you), I’m starting to get a little nervous. 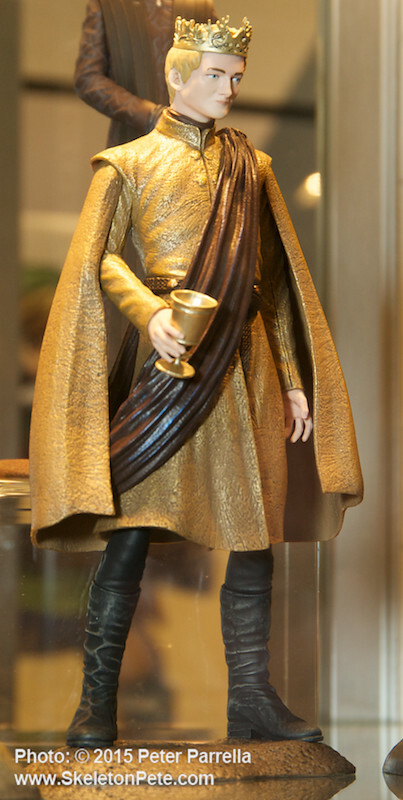 Unlike many of us who have read ahead to the bitter end, there are still folks out there who were shocked and horrified by the deaths of Robb Stark (Richard Madden) and his mother Catelyn Stark (Michelle Farley). 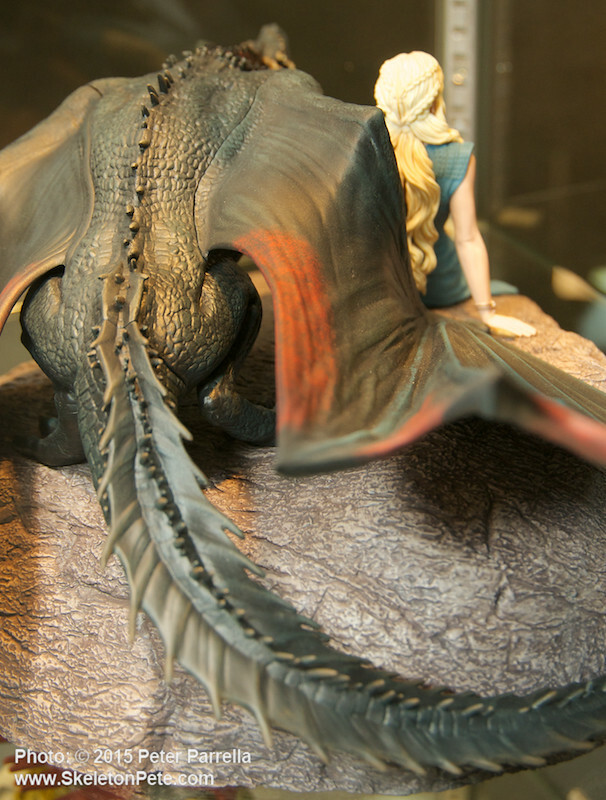 If you vowed to stop watching at that point, really, who are you kidding? 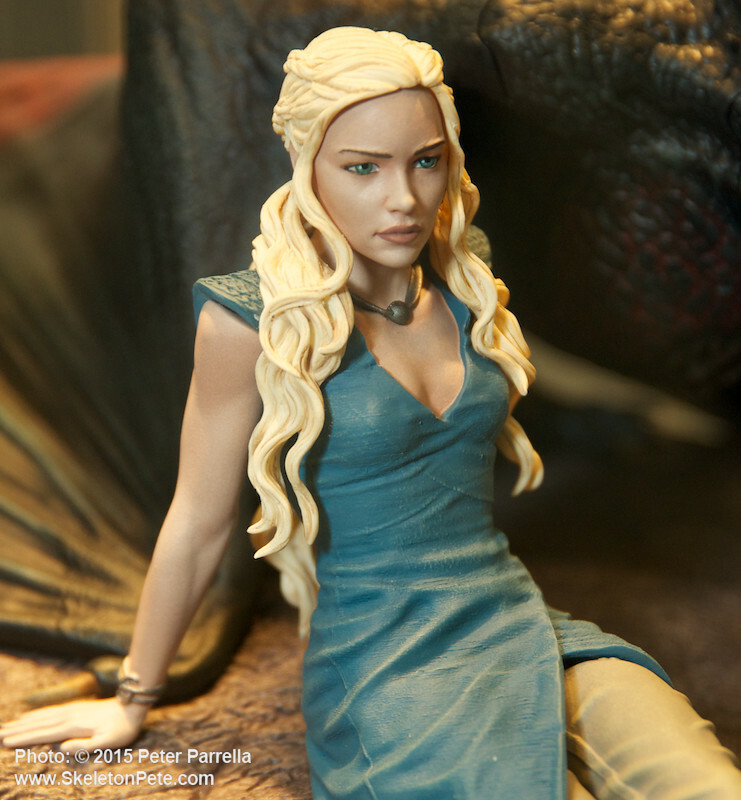 You know you’ll be back for more heart-stopping thrills, chills and heartbreak this season. 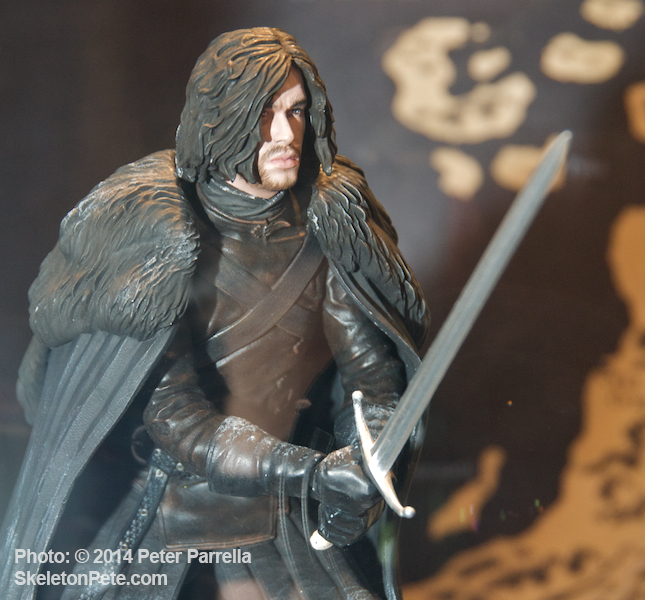 Dark Horse “Game of Thrones” Wave 1 Jon Snow Figure. 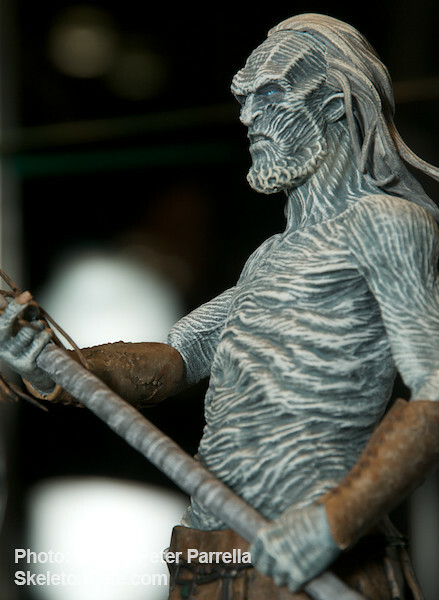 If “All Men Must Die,” here’s news and views of some items that Games of Thrones fans will be dying to get their hands on. 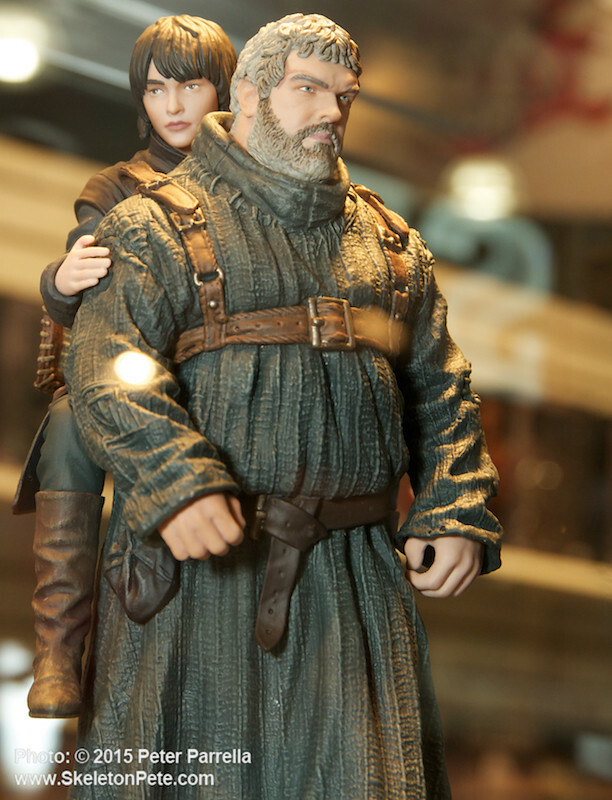 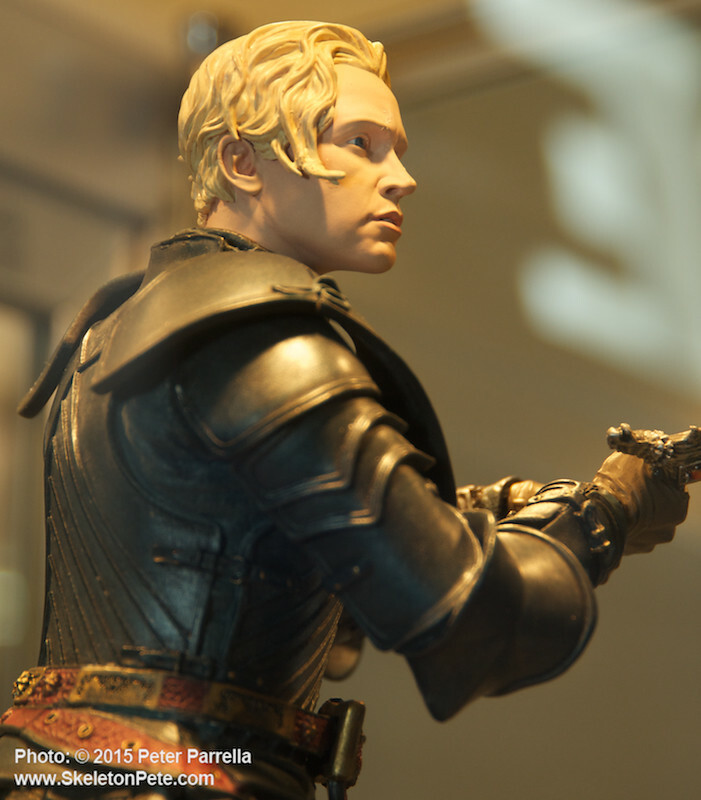 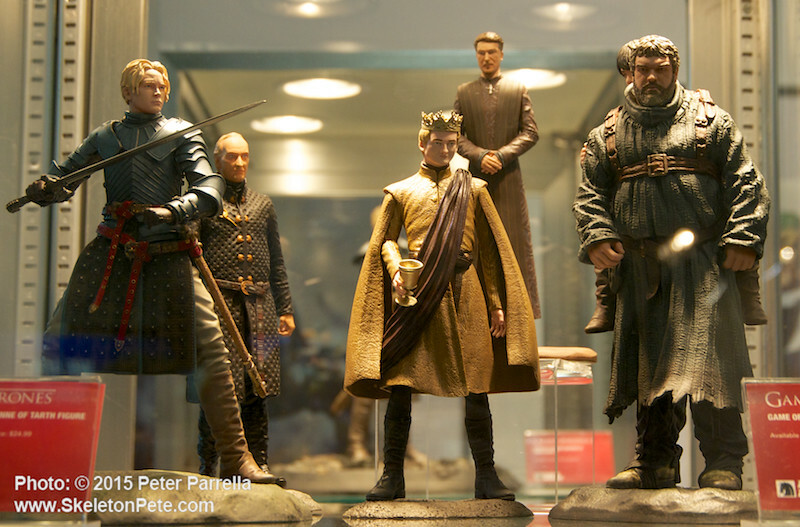 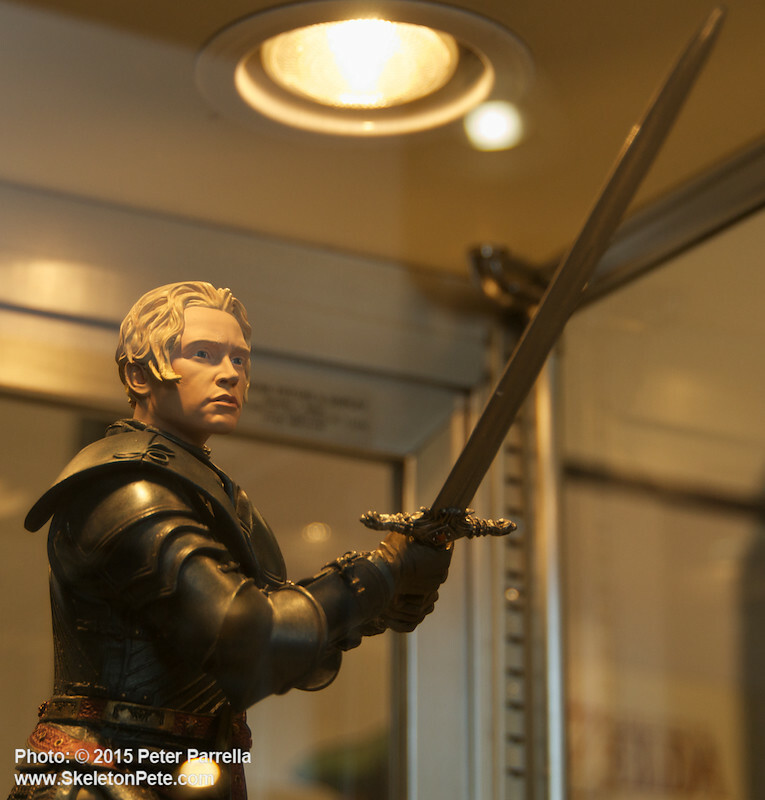 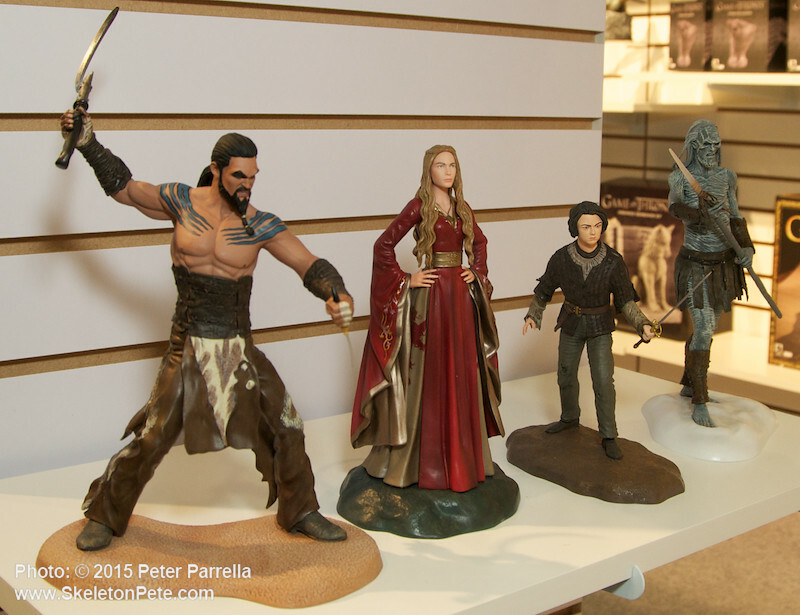 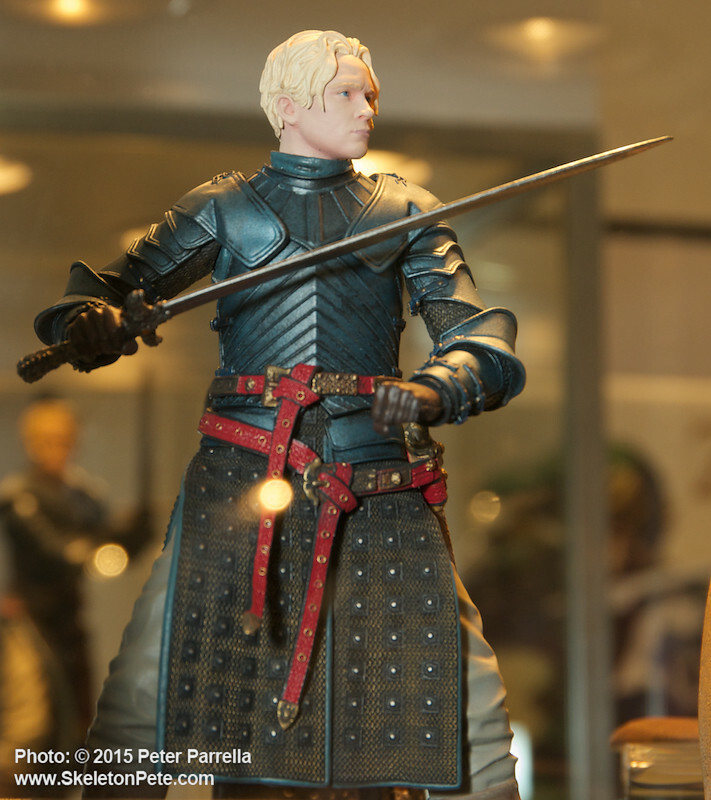 Joining the previously released Jon Snow and Daenerys Targaryen figures Dark Horse has several more characters at the ready to celebrate HBO’s Game of Thrones Season 4 premiere and beyond. 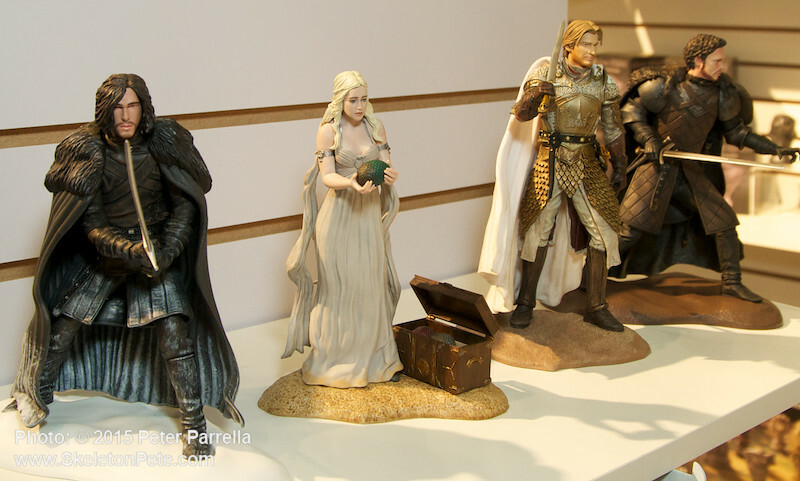 These plastic cast models offer a big bang for the buck with a refined elegance usually reserved for items several times their cost. 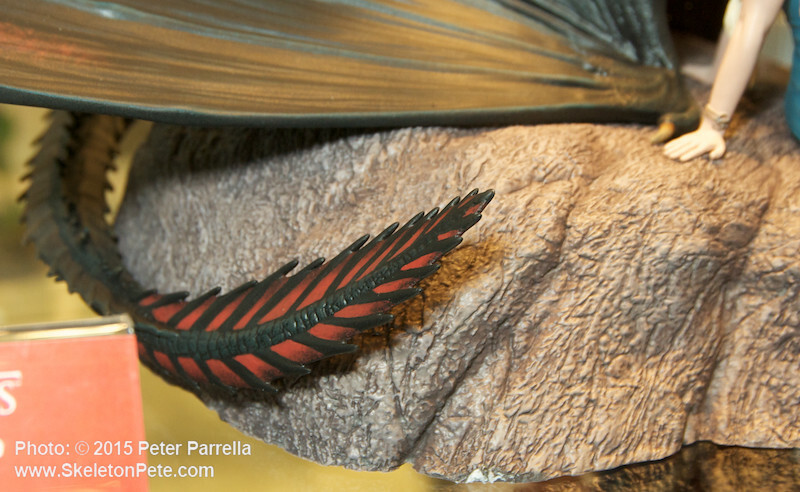 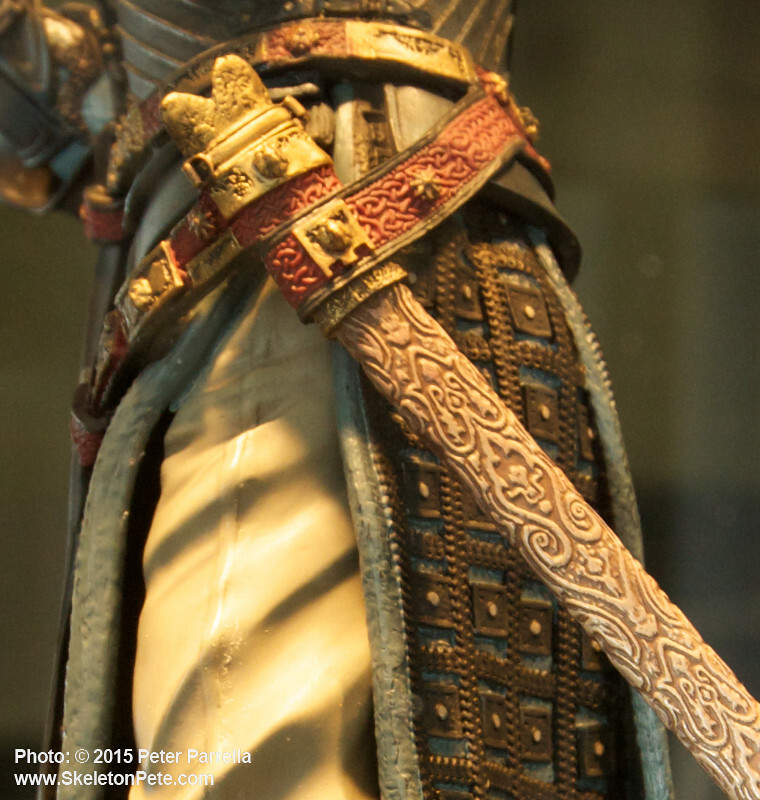 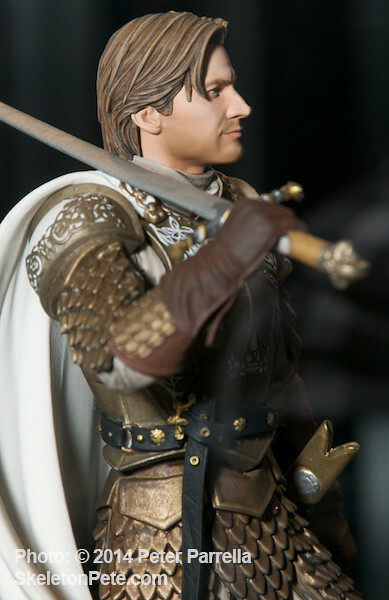 The sculpts are minutely detailed and delicately painted. 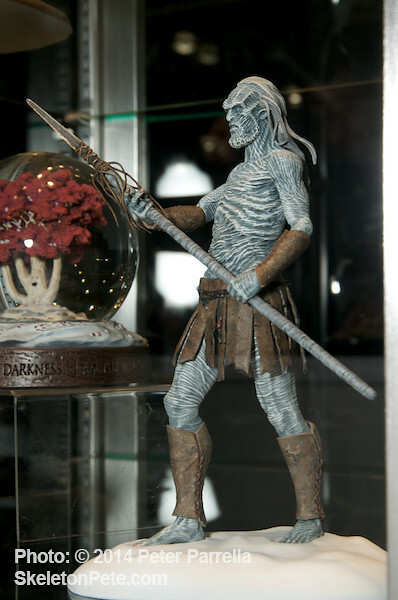 David Scroggy, head of product development for Dark Horse, noted “…we decided to make these non-articulated, in order to capture all of the small details that would be at risk in a traditional jointed action figure.” They stand approximately 7.5” tall and are sold in a windowed display box. 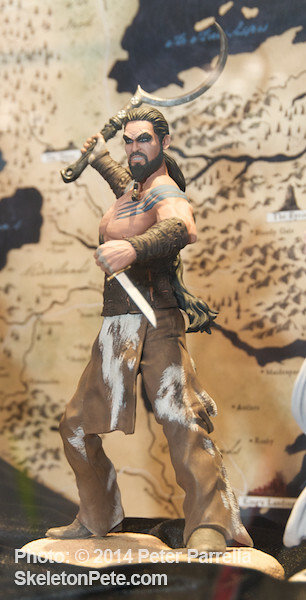 The Spring 2014 release included Tyrion Lannister, Khal Drogo and Ned Stark and will be followed in August by Cersei Baratheon, Robb Stark, Jaime Lannister, Arya Stark, and the White Walker. 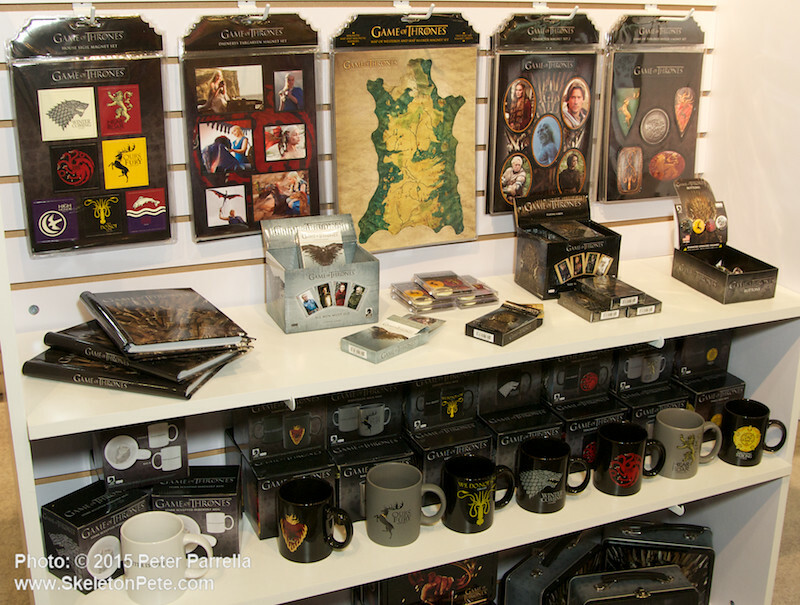 At a suggested retail price of $24.99 USD they make exceptional collector’s pieces and easy gift choices for the GoT fan in the family. 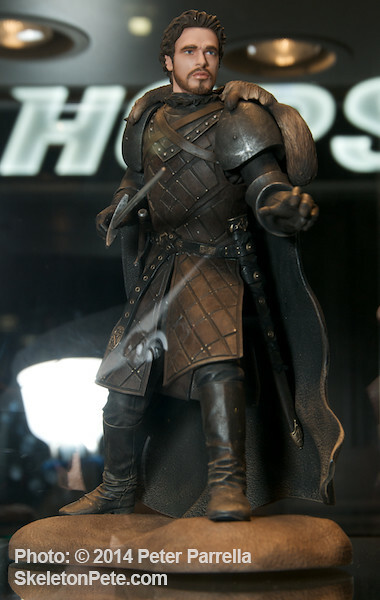 Limited Edition of Sandor “The Hound” Will Have A Unique Hinged Hood Feature. 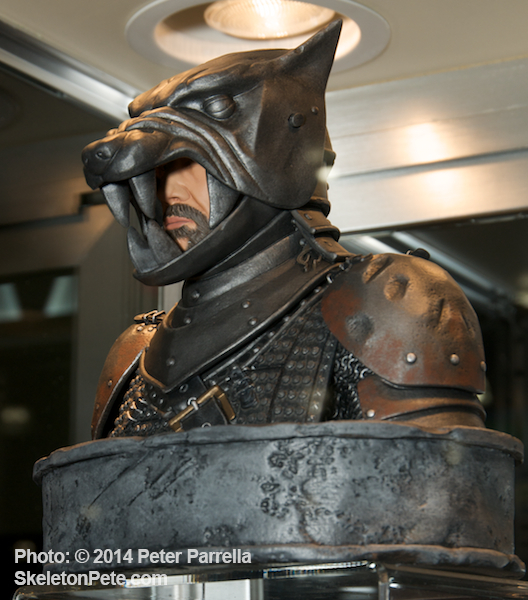 Also spied at Toy Fair 2014 was a spectacular spin on The Hound, in bust format replete with hinged helmet. 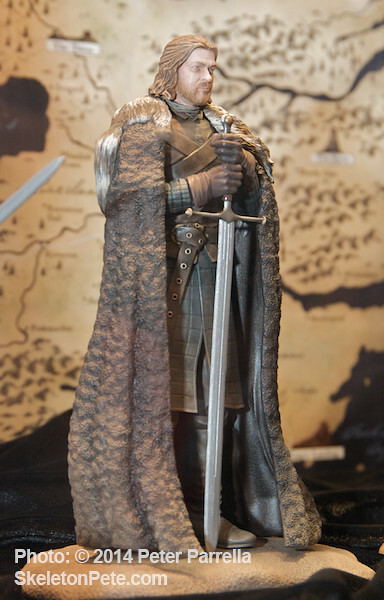 The likeness of character Sandor Clegane (portrayed by Rory McCann) is a hand painted and numbered edition that comes packaged with a certificate of authenticity. 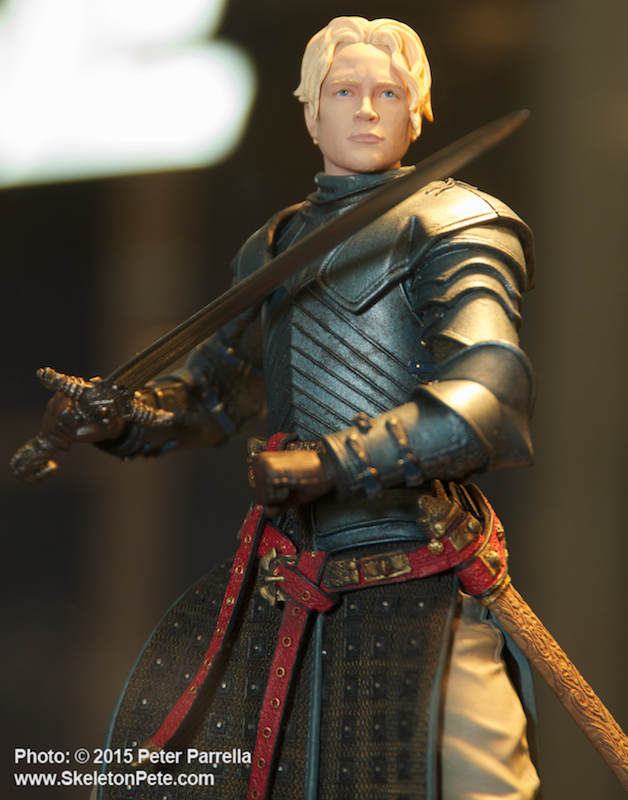 This one is scheduled for mid-summer release. 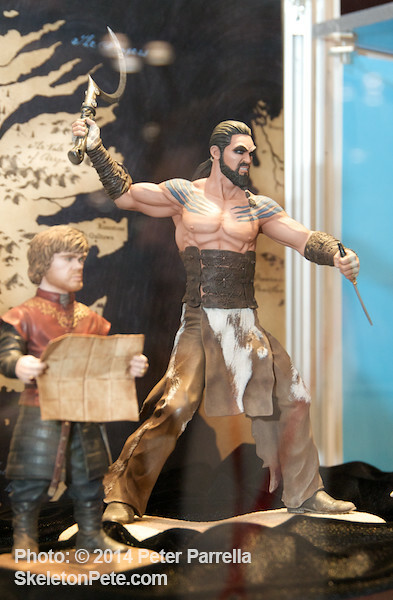 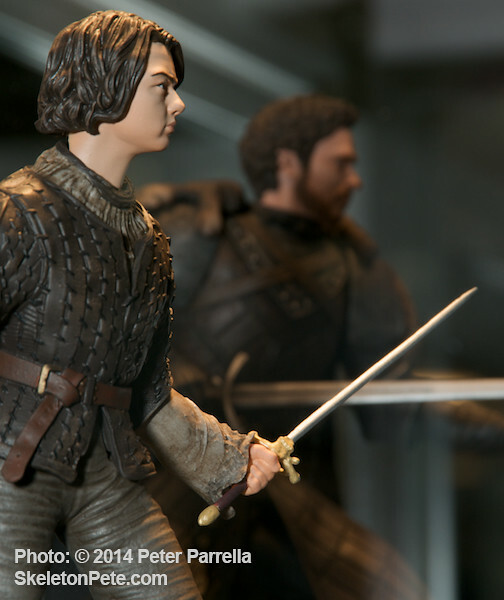 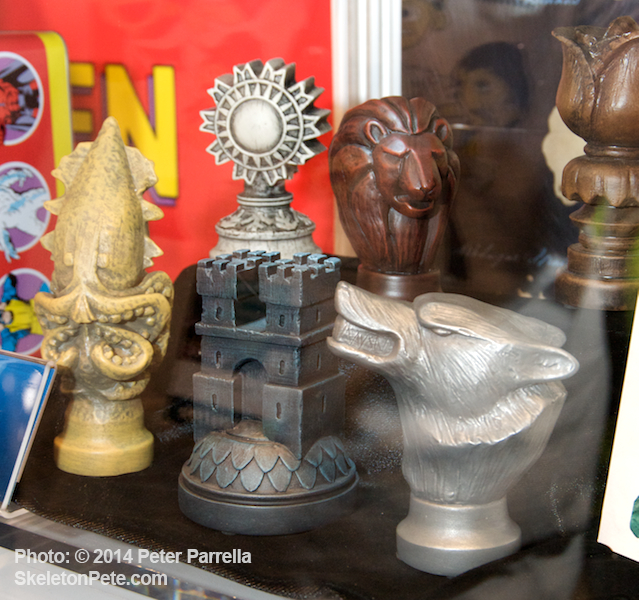 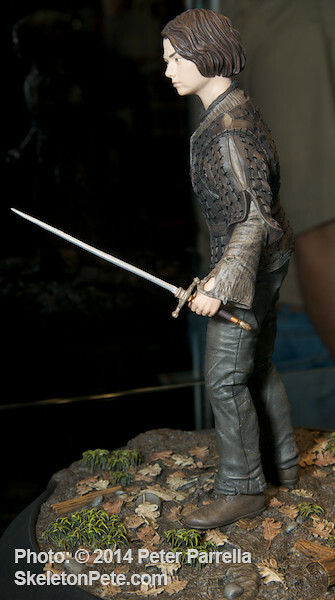 Also on the limited edition list will be an Arya figure. 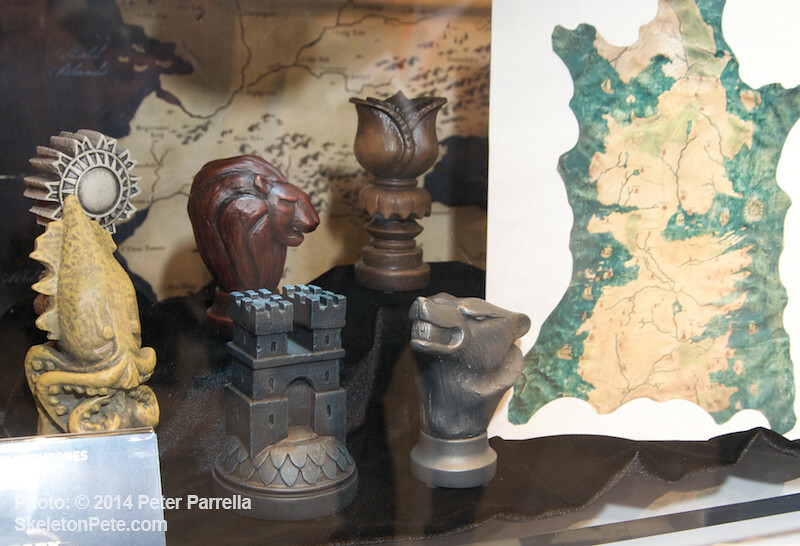 Life Sized Map Marker Set Includes Large Map to Plot Your Strategies. 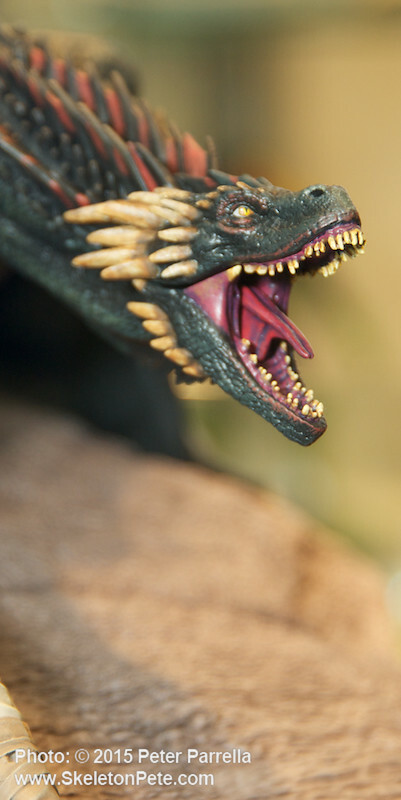 Just released this past week is a life sized role playing Map Marker Box Set. 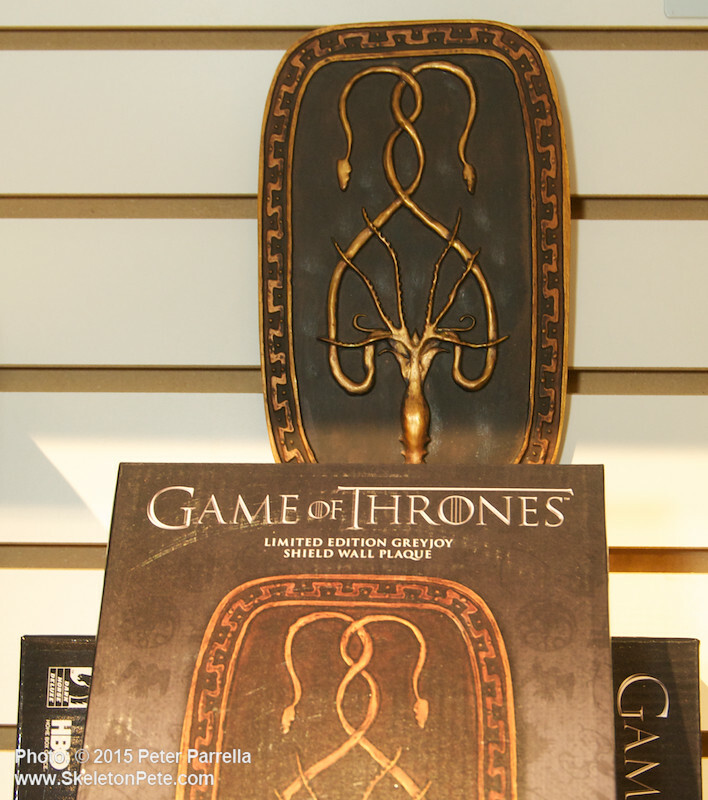 Dark Horse press explains the origins, “In the HBO adaptation of Game of Thrones, we see Robb Stark plotting the movements of opposing armies using a map of Westeros and a set of sculpted map markers, each hewn into a representation of one of the house symbols. 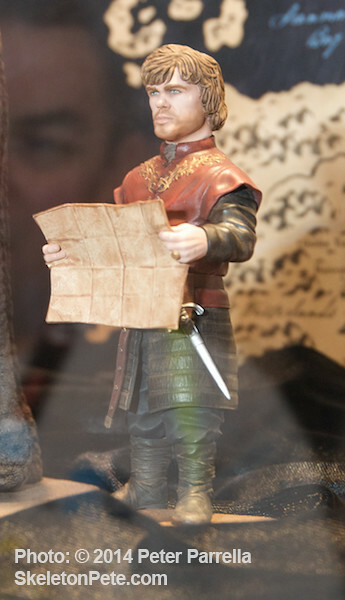 We have reproduced these items in their true size, using the actual props as reference. 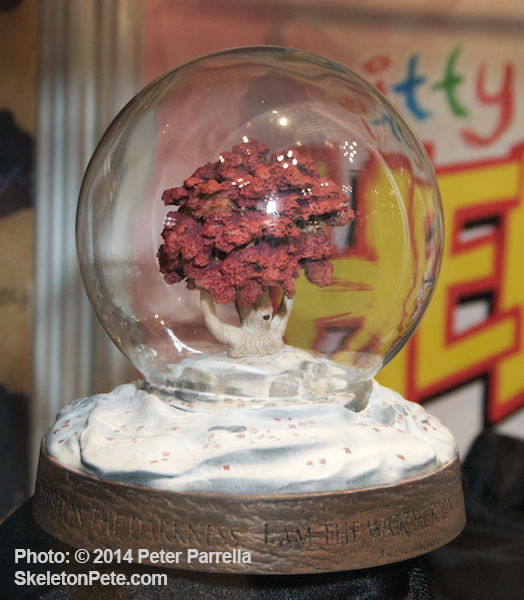 As if all this weren’t enough April 16th will see another limited edition piece, the Weirwood snow globe. 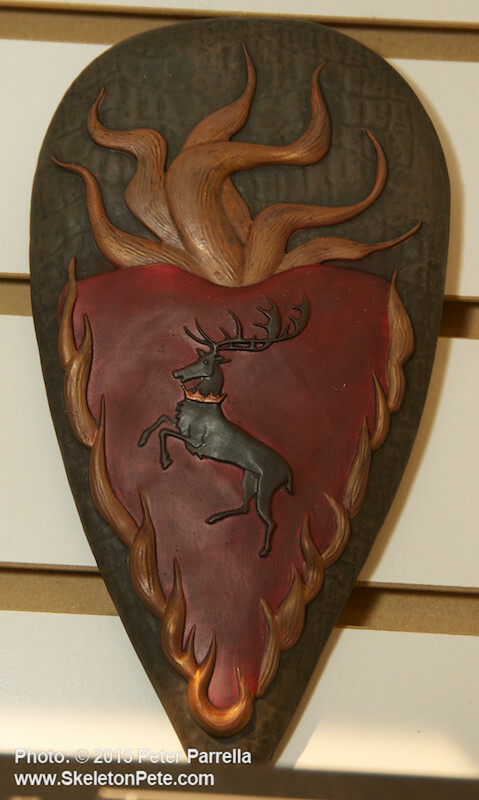 Its blush of blood red leaves atop the face carved trunk will make striking contrast to blowing “snow” inside. 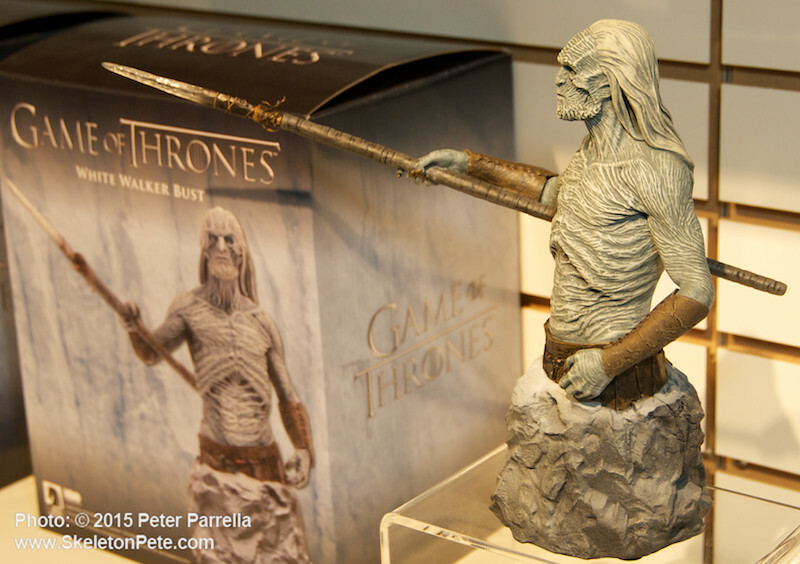 Its base is inscribed with the “I Am the Sword in the Darkness, I Am the Watcher on the Walls…” quote. 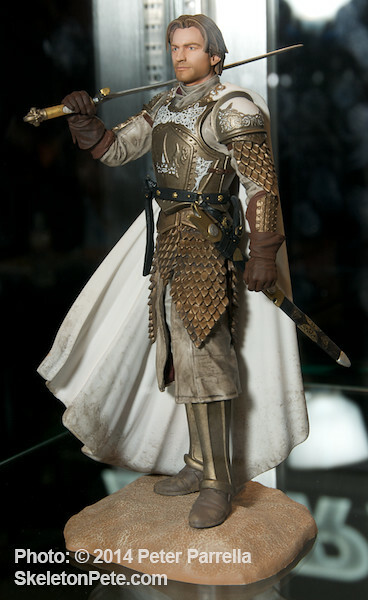 Only 1200 of these unique hand painted items will be minted and like other Dark Horse LE’s they will be boxed with a certificate of authenticity.